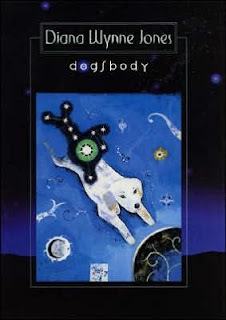 Anyway, since then I've read lots more Diana Wynne Jones books, and I've reread Dogsbody several times, which is just as good thirty years later. I'm pleased to see there's a new paperback edition with a brilliant introduction by Neil Gaiman. It's worth buying just for Gaiman's intro, which got me all choked up. Kristen, thanks again for hosting this wonderful blogging event, and for allowing me to be a guest on your blog! 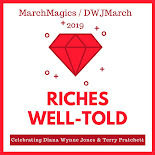 This is cross-posted on my blog, Books and Chocolate. Karen K. is a full-time library assistant living in South Texas who has waaay too many unread books on her shelves. Her favorite authors are Jane Austen, Anthony Trollope, Emile Zola, and Edith Wharton, and just for fun she'll take a break and read some riveting non-fiction or juvenile fantasy. When she's not telling other people what to read, she likes to knit, bake bundt cakes, watch movies, and hang out reading with her husband and two daughters. Her blog is called Books and Chocolate. Books like this are magical. When I think of children's books that stand the test of time, first I think of Dr. Suess. However, anyone who doesn't mention DWJ isn't doing themselves or anyone else a favor. She is one of those authors that make it seem effortless, just like the greats from any other walk of life. It would have been interesting to read Dogsbody as a child. I think I would have been traumatized by the puppy mill scenes and wouldn't have understood the Irish situation but I hope that I would still have liked it. As an adult, I thought it was brilliantly crafted. Dogsbody was my introduction to DWJ, but I was an adult! This one intrigued me and had me wanting to read more. Now, I just finished my third book by the author (Howl's Moving Castle), and my intrigue has only grown! Love her magic!! 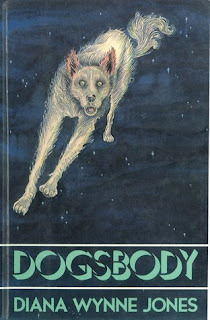 I think I was an adult when I first read Dogsbody, as well. It's one of my favourites. I shall look for the version with the Gaimon intro!